Traditionally known as one of Melbourne’s ‘boring’ inner-eastern suburbs, Hawthorn has undergone a major transformation. Today, the wealthy residential hub marries old and new with leafy tree-lined streets and grand heritage homes, just a stone’s throw away from the bustling student vibe around Swinburne University. What else does Hawthorn have to offer? Let’s take a look. First settled in 1830, Hawthorn in Melbourne’s Inner East is one of the surviving regions of post-Gold Rush expansion and is today one of the city’s most affluent suburbs. There’s no shortage of old money in Hawthorn, with property values among some of the highest in Australia. Streets such as Hawthorn Grove in the suburb's northern edge and Yarra Park's Coppin Grove in the west are home to some of Melbourne’s most sought-after Victorian heritage homes, with hefty price tags to match. The positioning of Swinburne University and a University of Melbourne campus in Hawthorn’s boundaries also creates a lively atmosphere in neighbouring areas, with plenty of food, entertainment and cultural offerings. Hawthorn is also well known for the size and number of its parks, many of which still retain original layouts from the 19th century. The suburb originally had a major brick-making industry, and many of the local parks are on sites of former quarries. Aside from Swinburne University and the University of Melbourne’s Hawthorn commercial campus, Hawthorn is home to a number of reputable private primary and high schools, such as Erasmus School of Primary Education, Saint Joseph's Primary School, Rossbourne School (a special education school), and Scotch College. Hawthorn is also close to a number of government primary schools, including Glenferrie Primary School, Hawthorn West Primary School, Auburn Primary School, and Auburn South Primary School. The area also gives access to nearby high schools such as Auburn High School and Swinburne Senior Secondary College. 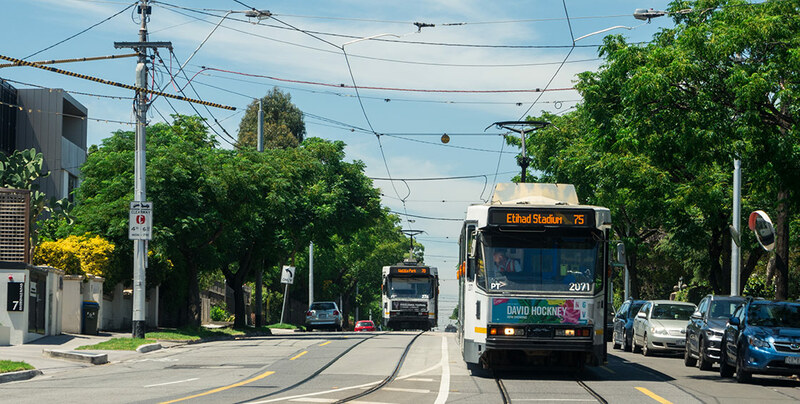 Hawthorn is well connected by three nearby railway stations – Hawthorn, Glenferrie and Auburn – and is also served by tram routes 16, 48, 70, 72, 75, and 109. It takes around 20-30 minutes to get from Hawthorn to the Melbourne CBD by public transport, depending on where you’re coming from in the area. Driving to the city also takes around 20 minutes, but keep in mind that street parking in Hawthorn can be difficult in some areas, especially around busy Glenferrie Road. There are shopping options aplenty to choose from in and around Hawthorn. Glenferrie Road is the area’s major shopping district, with two supermarkets, banks, and a big range of chain stores and speciality boutiques. There are also shopping centres at the corner of Burwood Road and Power Street, on Church Street, on Auburn Road, and at the corner of Glenferrie Road and Riversdale Road. The local council (Boroondara City Council) along with Swinburne University and other local organisations manage a wide array of public facilities, including Hawthorn Aquatic & Leisure Centre and other sportsgrounds, public barbecues, youth clubs (including the Hawthorn Citizens' Youth Club, scouts and guides), and churches of many denominations. There are also plenty of medical services and hospitals nearby, including Epworth Hawthorn, Glenferrie Private Hospital, Hawthorn Medical Centre, and Glenferrie Hill Medical Centre. Tucked away in Hawthorn’s Beehive Complex, Ocha offers traditional Japanese flavours with a modern touch. On the menu you’ll find all the usual suspects like gyoza, udon, and yakisoba, as well as more daring delicacies like beef tataki – rare beef carpaccio with ponzu sauce. For a cheaper meal, head down during the day to take advantage of one of the lunchtime specials. Chef Greg Feck and his business partners are huge Venice fans, and it shows in how lovingly they’ve recreated its charm at Venetian-inspired Vaporetto Bar & Eatery on Glenferrie Road. Step through the old tobacco storefront, order a plate of fresh seafood and a cocktail, and you may as well be sitting on a gondola in the City of Canals itself. Crabapple Kitchen is the other brainchild of chef Greg Feck, whose mission was to bring the freshness and quality of Victorian produce to this charming local cafe every day. The Mediterranean-inspired menu is extensive and carefully curated, with breakfast, lunch and sharing items on offer. With the décor consisting of pleather-backed chairs, a beige tiled floor and not much else, Penang Coffee House is no-frills cheap-and-cheerful fare at its finest. The delicious Malaysian food is also about as authentic as you can get outside of Malaysia, so pop in for a laksa and a roti, and you’ve got dinner sorted for under 20 bucks. Fine wine, smelly cheese, good company: these are a few of our favourite things, and they’re all very easily attainable by booking a catch-up with friends at Gibson’s Wine Bar. There’s even a takeaway option if you feel like getting fancy from the comfort of your couch. Bon appétit! Lido Cinemas’ history stretches all the way back to the 1880s, when it began life as a theatre before becoming a pool hall, dance studio, and finally sitting empty for over a decade. Since then, it’s been revived as a vibrant eight-screen cinema, showing commercial and art-house films from all over the world. Downstairs, you'll also find a Huxtaburger where you can grab a pre-movie bite, and afterwards you can check out the Lido Jazz Room – an 80s-Manhattan-inspired jazz bar that hosts weekly live jazz performances. Get your creative juices flowing in a short class at Creative Commune in the Hawthorn Arts Centre. Whether it’s photography, donut making, nail art, sneaker design, or anything else that takes your fancy, there’s a class with your name on it here. Held on the first Sunday of every month, Hawthorn Makers Market’s legacy spans nearly 40 years and today is home to more than 70 stallholders offering up handmade wares of every kind. Think handcrafted jewellery, stationery, accessories, and homewares, as well as handy items for the garden and tasty home-baked treats. Read our suburb profile for Hawthorn or request a free online estimate for a property in Hawthorn. The Upside property report uses historical suburb data, as well as comparable sales and other information, to offer an in-depth understanding of the property you’re considering. Plus it takes just 30 seconds to complete!